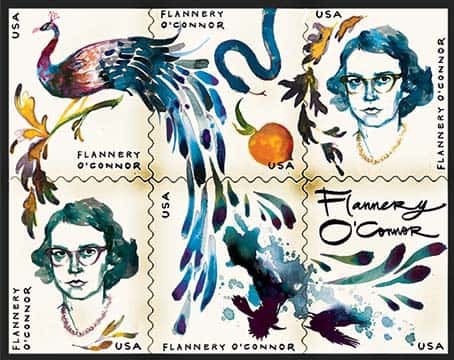 The United States Postal Service issued new Flannery O'Connor stamp on May, 2015 that has a gorgeous look of her bright portrait and a peacock silhouette and feathers. Also, recently all O'Connor's fiction was reissued and given a new beautiful cover painted by June Glasson and developed and designed by Charlotte Strick. This stamp is quite extraordinary, but it doesn't make it bad, it is saturated and interested. Charlotte gave a little interview regarding new Flannery O'Connor stamps design. Charlotte said that the most difficult is to create the adequate design that is sufficient and easy to remember despite the format. Nowadays book jacket designs' first demand is to be clear and appropriate for digital formats and in small stamp size. It was challenging and interesting for her to create the image that small (1 1/2 x 1 1/4 inches). She was excited to create an official post stamp for the United States Postal Service, it was nice that they agreed on such extraordinary stamp-image style and it was worth it. The design concept was to create the set of 6 stamps that combine into the puzzle image and that reminds newly released cover of O'Connor's books. The troublesome moment was to create not only the 6-components puzzle, but to make each stamp an independent work of stamp-art. The idea to take June into the team originated from the cover for Wise Blood created by Milton Glaser in 1967. His blackish style of illustration brought Charlotte back to the Glasson's layered ink works. June's series "The Foulest of Shapes" amazed Charlotte with its harsh attractiveness. It was exactly what she wanted to see in O'Connor series. Speaking about the authors that can possibly appear on the stamps, Charlotte believes it to be a quite hard question, because the USPS honored a lot of authors she appreciates. Though, it may be a good idea to rethink the stamps and renew the illustration. The only author that came to her mind that hasn't been on the stamp was M. F. K. Fisher. She said that as it is an era of food lovers, maybe it is time to honor some US food writers.